1) Suspension settling: Process in which fine-grained, platform-derived sediments are transported off the shallow water platform by tidal flux, storms and oceanic currents as sediment-sea-water mixtures. When these plumes of material dissipate, this fine-grained material settles to the sea floor. Recognition of suspension settling on ancient slopes can be difficult. In places where carbonate is finely laminated, suspension settling may have occurred in an oxygen minimum zone. Ancient slope sediments exhibiting evidence of bioturbation, primary sedimentary laminations, and nodular bedding suggest the slope can also be oxygenated. A) Turbidities: these gravity flow sediments represent locally stirred-up sediment that forms a fluidized liquid and suspension which has a density greater than the surrounding water. These flows are rapidly transported as suspended sediment down-slope to the lower slope or basin. They are characterized by graded bedding, moderate sorting and well-developed primary structures that include laminations; this combination of features enhances the recognition of turbidites that have accumulated on ancient slopes. Click here to see an animation of a turbidity current. B) Debris Flows: These flows consist of a mud and water matrix with a combined strength and buoyancy which allows the flow to carry clasts that are denser then the flow itself and can travel distances that may exceed 100 km from their source. The deposit that results is sheet-like. Common features include lenticular beds that gradually pinch out, poor sorting, lack of stratification, random clast arrangement. Clasts are rounded to angular, and range in size from gravel to boulders and set in a matrix, which can vary from fine-grained carbonate to terrigenous mud. 3) Talus: Talus forms down-slope as ever widening conical accumulations along the top of the slope below steep escarpments. Talus blocks probably tumble into place. Merging of adjacent talus cones forms a distinctive but narrow facies belt. Identifying this facies in ancient slope deposits can offer information as to slope gradient and orientation. 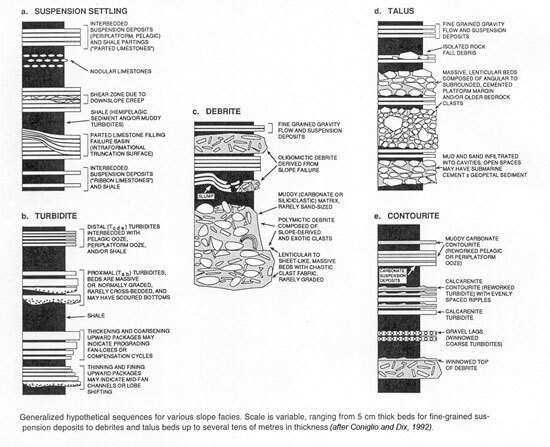 3) Contourite Facies: These deposits result from currents flowing parallel to the slope. They mostly consist of platform sands and gravels, and are characterized by a high degree of sorting, evenly spaced ripples, lack of mud, and sharp contacts. Contourites can be used to identify the orientation of ancient slopes since their origin is a flow direction parallel to the slope. 1) Slide: A slide is the movement of a rigid, internally undeformed mass along a discrete shear surface. If internal deformation occurs during the journey down-slope, the sliding mass may turn into a debris flow. The distinction between these surfaces is usually not recognizable in ancient sequences. 2) Slide scars: A trough or concave depression recognized on modern and ancientslopes by the abrupt termination of older strata and the anomalous thickening of infilling younger units. 3) Downslope Creep: This process results from bedding parallel translation along a well-defined surface lacking a basal shear plane.This is a long-term process most common to slopes within an unlithified sediment pile.